What I have recounted so far is the public history of the Radio happenings. For me, though, there is a more personal history: the story of how they came to light and were preserved. It all happened because of procrastination and the pre-Internet digital social world of Bulletin Board Services in New York City. In 1987, I was living in Brooklyn, on Avenue H in Flatbush, at the end of the #2 subway line. For the previous three years I had been researching John Cage’s early chance compositions. Now I had a grant from the university to work on my doctoral dissertation, and my plan was to complete it that year. But as probably all dissertation-writers do, I was procrastinating. 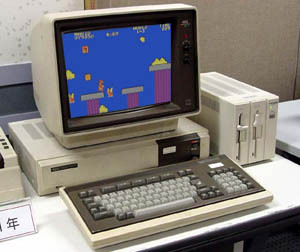 My distraction of choice was the computer, which I had purchased when I started doing my research (the photo above is the model I had, an NEC 8801, although I did not have a color monitor). I taught myself various programming languages and spent an inordinate amount of time customizing my system. After I got a modem, I discovered a new way to waste time on the computer: dialing up local Bulletin Board Systems (BBSs). These were the precursors to today’s social media, places for people to meet and have conversations. Just like today, people on the message boards got into fights over politics, shared their obsessions with like-minded people from around the area, talked about their work and home lives. It was like connecting through your computer to a virtual pub or cocktail party. This was before the internet: to log in you dialed directly from your modem to the BBS’s modem. I got a list of BBS numbers in New York City and started connecting. I had one particular favorite BBS—”Magpie”—and I spent most of my online time there. Magpie was an unusual system, run by Steve Manes. He had written the software himself, and one reason I liked it was that it used a tree structure for messages so that you could easily follow conversations. A wide range of people showed up here and from my desk in Flatbush I made friends with people all over the city whom I would never have met in my normal life. One of these was Jim Freund. Jim’s area of expertise was speculative fiction (science fiction, fantasy, etc. ), but he had a wide range of interests and talked with everyone at the BBS about all kinds of subjects. He was friendly and helpful and not prone to ranting (as others often were). Since 1974, he had his own radio program at WBAI, The hour of the wolf. At the time I met him, the show broadcast at 6:00 AM on Saturday mornings. He would interview authors, do readings, and play music. In the mid-1980s management had been changing at WBAI, and, in Jim’s view (and the view of many long-standing staff) not for the better. His Saturday early morning time slot was the result of one of the management reorganizations of the schedule, and he was not pleased with it. He felt that the current management did not really understand what WBAI was all about, that they were not connected to its history. So when, one day at the studio, he spotted some open-reel tape masters of shows with John Cage, he was concerned that they would just be tossed in the trash, another piece of devalued WBAI legacy. And, luckily, he thought of me. Jim, like everyone at the BBS, knew that I was researching Cage: I often talked about music and my work. Jim told me about the tapes he had found at WBAI, that he had no idea what was on them, but that he felt that they needed safekeeping. He asked if I would be interested in holding onto the tapes—not permanently, but just until things settled down at WBAI. Of course, I eagerly accepted the offer. We met at an Indian restaurant in the East Village. It was a rare face-to-face meeting of friends from the BBS, a chance to see these people we only knew through messages displayed on our CRT terminal screens. There were maybe a dozen or so of us there. Jim brought a large shopping bag with the five master tapes in their original boxes. As I like to tell this story, the Cage-Feldman Radio happenings were literally handed to me under the table at the restaurant. When I got the tapes, I was very concerned about their condition. Were they too fragile to be safely played? In retrospect, I realize that my fears were unwarranted: open reel tape is remarkably robust, and these tapes were only twenty years old. But at the time I had horrifying images in my mind of the tape reels rolling and the magnetic media flaking off in a cloud of dust. I made some inquiries about tape preservation. These settled my mind and, following a physical inspection of the tapes, I gathered my courage to play them. I used the sound studio at the Brooklyn College Center for Computer Music (BC-CCM). I was living with composer Frances White, who at that time was doing all of her work at BC-CCM, studying with Charles Dodge. I had started hanging out at the studio with Frances, learning more computer programming and getting to know composers there. One of these was Curtis Bahn, who at that time was also the technical director at BC-CCM. I helped him with system administration and did other work with composers there, supported in part by an NEA grant the Center got to provide community access to the equipment there. I decided that the best thing to do was to immediately make a digital copy of the tapes and then make subsequent copies from the digital master. That way, I would only have to play the original open reel tapes once, minimizing the possibility of damage. In those days, we used Betamax tape to store digital audio. There was a tense moment when the tape broke at this point: the splicing tape had lost its adhesion. I replaced it and the rest of the tape played without incident (there were no further splices in the masters, which suggests that the shows were unedited). For the next four and a half hours, I—and everyone else who passed through the studio that day—listened to John Cage and Morton Feldman having a conversation. The format was surprising: no music! Charles Dodge thought it was very civilized. David Arzouman, a composer working at the center at that time, felt like he had been invited into someone’s living room where Cage and Feldman were just chatting. We all had much the same reactions that people have had since then, noting the long pauses in the conversation, the obvious ease that Cage and Feldman had with each other, the feeling of listening in on very personal conversations. When doing the digital transfer, I also made cassette copies of the shows for myself. After that, I made additional cassette dubs of the tapes from the digital masters, including a set for John Cage (Feldman had died the year before, and I had no contact at the Feldman estate to whom to send tapes). Laura Kuhn worked with Cage at that time and made transcriptions of the shows. The typescripts of these and copies of the cassettes I gave Cage have since circulated widely. The fifteen-second gap in Radio happening V (which I wrote about in the first installment of this series) was caused by a mistake I made while making the digital transfer of that program. As a result, it has turned up in every version of the show that I have found, other than my cassette, which was made directly from the open reel master. In 1988 I moved out of Brooklyn. Frances White and I married and moved to Princeton, where she was a graduate student. I left the Radio happening master tapes behind at BC-CCM, where they could stay in archive storage under the care of Curtis Bahn. In the mid-1990s, after Cage’s death, I told Brian Brandt of Mode Records about the tapes, and he expressed an interest in releasing them on CD as part of his Cage Edition. We knew that he could not do this without permission from the radio station. He pursued this, negotiating licensing terms with the Pacifica Foundation. Unfortunately, he could not license the tapes at rates that would be financially reasonable. Pacifica was used to licensing short bits of audio, not multiple hours, and their standard rates did not scale up well. Mode’s CD release plans fell through. In order to work with Pacifica, however, it was necessary for the first time to inform them that the tapes even existed. Naturally, they wanted them back. Curtis delivered the tapes from Brooklyn to our place in Princeton, and Pacifica sent UPS to pick them up and deliver them to their headquarters in Berkeley, California. Today they are part of the collection of public broadcasting materials stored at the University of Maryland–College Park: an interesting coincidence, since that’s where I first discovered the music of John Cage and Morton Feldman as an undergraduate music student. After the tapes went to Berkeley, my role in the Radio happenings story was over. I’ve always looked back at the experience as a rare musicological adventure. Over the years, it has been a fun story to tell people, and I’m glad to finally get it into print here. Above all, I’m grateful that circumstances arose for me to help preserve these unique and valuable radio programs. It is remarkable how much e-documentation we take for granted today. But in the mid-to-late 1980s things were quite different. I do not have any e-mails or other digital documentation of my chats with Jim Freund and others. So this story is told almost entirely from memory, and I’m sure that parts of it could be muddled. Since I first posted this, a few people have reminded me of details that I forgot or mis-remembered the first time around. Joseph Zitt (who runs the Cage mailing list Silence) was another of the interesting people I met on Magpie, and he reminded me of the system name and who ran it. Curtis Bahn told me about that NEA grant which, unknown to me, was helping support the work I was doing there. E-correspondence with Doug Cohen at BC-CCM about the digital masters there helped me to sort out the true story of the now-infamous 15-second gap in Happening V (or at least I think I have the true story now). Gisela Gronemeyer-Öhlschlägel of MusikTexte shared correspondence with the Pacifica Archives that revealed where the tapes finally ended up.